Before leaving on my sabbatical, I preached a sermon from Genesis 12 entitled “Reclaiming a Founding Vision.” In Genesis 12 God covenants with Abraham and Sarah, promising to bless the nations through their descendants. That is, I believe, our founding vision. In Christ we become children of Abraham so that we might be a blessing to the nations. Sometimes we get so caught up in the business of religion that we forget our calling. Fortunately, God remains faithful to this covenant, and has a way of rekindling that vision in our hearts. The title of that sermon, “Reclaiming a Founding Vision” served as theme of my sabbatical. Since pastors are tempted to get focused on the mechanics of the institution rather than the vision that guides us a congregation, the sabbatical provided me the opportunity to remember and reclaim that vision for my life, so that I can lead this congregation in fulfilling our calling to be a community of blessing to the nations. For the next seven Sundays I’m going to share insights that I gleaned from my sabbatical journey. The first two sermons will lay the groundwork for what follows. This week the focus is on the way in which this founding vision gets passed on down through the ages – from Abraham and Sarah, through Jesus, and on to us. Next week the focus will be on resetting our compass when we lose sight of that original vision. You may have heard me share Jaroslav Pelikan’s distinction between the two: “Tradition is the living faith of the dead, while traditionalism is the dead faith of the living.” The danger that Tradition presents is that it can easily become an idol, and it becomes an idol “when it makes the preservation and the repetition of the past an end in itself” (The Vindication of Tradition, p. 55). You’ve heard it said – “we’ve never done it that way before.” Or “this is the way we’ve always done it.” That’s “traditionalism.” Tradition, on the other hand, is a treasury of encounters with the living God, which have been passed down to us through scripture, through story, through liturgy and sacraments, through art, and even in stone. Tradition is a living witness to God’s covenant of blessing, made first with Abraham and Sarah and then passed on through time to us. During my sabbatical I had several opportunities to connect with these life-giving Traditions. I’ll be sharing some of these encounters with you in the sermons and also at our February 22nd retreat. The first stop of my sabbatical adventure took me to England. Since my scholarly interests and my spiritual roots are connected to the Anglican Tradition, I decided to start there. Among the highlights of my trip was the opportunity to explore ancient churches and cathedrals. I got to step back in time and experience the rich heritage that is encased in stone. Some of the churches I visited go back to Anglo-Saxon days – back before the Eleventh Century. One of the things you notice as you walk through these churches are the monuments to people long since deceased. 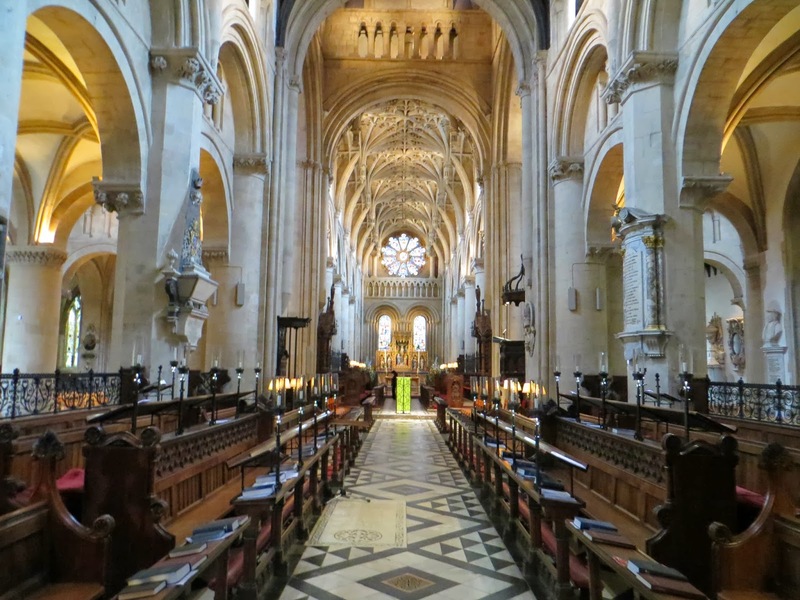 At Christ Church Cathedral in Oxford, where I worshiped on four occasions, you’ll find many of these monuments. There’s a marker for the burial site of the philosopher John Locke. There is also a marker reminding us that John and Charles Wesley were ordained to ministry in that church. As I contemplated the monuments and the shrines, I felt the presence of the great company of saints joining with us in the worship of God. And when I went to the altar to receive communion in Oxford and at St. Paul’s, I took a journey that thousands of others have taken down through the centuries. We don’t bury people within the walls of this church. 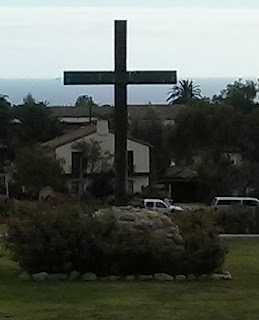 There are, of course, little monuments to people whose lives are connected to this congregation, but do you feel the presence of God’s saints now departed standing with us as we worship together in this space? When twenty-first century Christians gather to sing and pray, when they practice the sacraments of baptism and communion, they are not making up those forms on the spot. All of those are an inheritance from centuries of Christian belief and practice. (The Spiritual Practice of Remembering, p. 9). In a few moments we will gather at the Lord’s Table. Written on the Table are the words: “In Remembrance of Me.” As we take bread and cup, we are invited to remember that God is revealed to us in the life, death, and resurrection of Jesus. This service of the Table isn’t a funeral. The one we come to remember isn’t dead. Instead, Jesus seeks to meet us at the Table so that we might be nourished and fed for the journey ahead, a journey that brings blessing to the nations. The people of God are directed to not only remember this confession of faith, but they’re to pass it on from generation to generation. In other words, don’t just send them off to Sunday School, but make these commands the centerpiece of your lives together as a family. Help your children incorporate this faith tradition into their own lives, so that they too might come to know the living God. Unfortunately, many Baby Boomers didn’t heed the words of this song. When it came to matters of faith, many parents decided to let their children decide for themselves. In other words, they didn’t make any effort to recite these commands to their children. As a result, many younger adults have had little exposure to the Tradition that has been passed down from generation to generation. So it’s no wonder that the fastest growing religious group in America is one that chooses not to state a preference. Now I’m not encouraging coercive parenting, but it is important to share that which is most dear to our lives with our children. That’s the bad news. The good news is that God is faithful. There is a Tradition that continues to be passed on from generation to generation, even if it is being left to a remnant. That’s okay, because that remnant has the opportunity to reclaim the founding vision. It’s a bit like medieval Europe, during that time when literacy began to fade. The monks kept busy copying ancient manuscripts, including biblical texts, so that later generations might have access to these riches. We are the inheritors of these traditions. They needn’t become idols. Instead, they can be and are witnesses to the ongoing presence of God in our midst. For this purpose he called you through our proclamation of the good news, so that you may obtain the glory of our Lord Jesus Christ. So then, brothers and sisters, stand firm and hold fast to the traditions that you were taught by us, either by word of mouth or by our letter. (2 Thess. 2:14-15 NRSV). Or as Ruth Duck puts it: “‘tradition’ is not an unchanging heritage but a never ending process of passing on faith in ever-changing ways” (Worship for the Whole People of God: Vital Worship for the 21st Century, p. 265). As we come to the Table this morning, may we look back to that founding vision that God planted with Abraham and Sarah. It is a vision that God rekindled in the ministry of Jesus. It is a vision that has been passed down to us through the ages, so that we too might share in this ministry of blessing to the nations.